It was just a simple daily create. Well today’s could be simple (take a photo of a cloud) but the prompt was to play with the idea of the Judy Collins song Both Sides Now. Bows and flows of angel hair and ice cream castles in the air and feather canyons everywhere, I've looked at clouds that way. But now they only block the sun, they rain and snow on everyone. So many things I would have done but clouds got in my way. I've looked at clouds from both sides now, from up and down, and still somehow it's cloud illusions I recall. I really don't know clouds at all. Clouds as beauty to gawk at clouds as things which block the light and make you cold. What is the illusion, Judy? I got only a late in the day show of some variable textured clouds on a blue sky, billowing beyond a twin pair of apartments that are near my apartment I am staying in this month in Puerto Rico. My cloud photo felt so ordinary. So I tossed it into Intensify Pro, and added some more vivid settings. By I don’t have the both sides. So now my idea is to put the before and after photos in the Knight Lab Juxtapose tool (worthwhile since it is one of the Web Tricks I am demo-ing tomorrow for a faculty workshop. 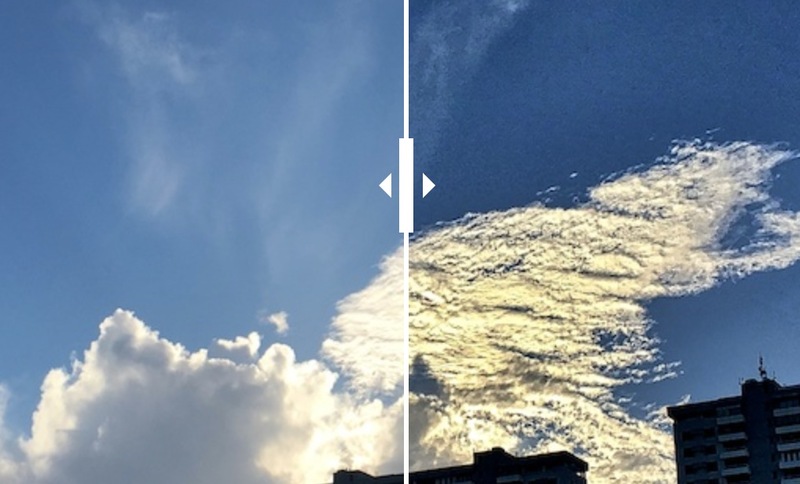 So my both cloud sides are the real and the super real- HDR is really just representing the image data in a different set of intensities and values than the eye might see by itself. To use Juxtapose your images have to be somewhere on the net at a public URL- that could be a static URL from flickr, or tossed on your web server, Google Drive. or as I did mine, in my Public Dropbox folder. They do not host the thing for you, you get cut and paste iframe code that produces what (I hope) you see above. And I had to put it somewhere (here) to embed. It’s supposed to be responsive and work on mobiles. Both sides. This was the idea of my first SPLOT built last year, the Comparator, the one that is least developed and more wobbly. However, it does host the whole thing via a URL and offer embeds. Both sides of clouds and juxtaposing? A Farce Performance: Honor a Request to Remove Old Blog Comment Spam?